These two letters were written by Pvt. Lemuel Fordum Mathews (1840-1889), the son of Newton Mathews (1808-1880) and Mary Wycoff (1809-1880). 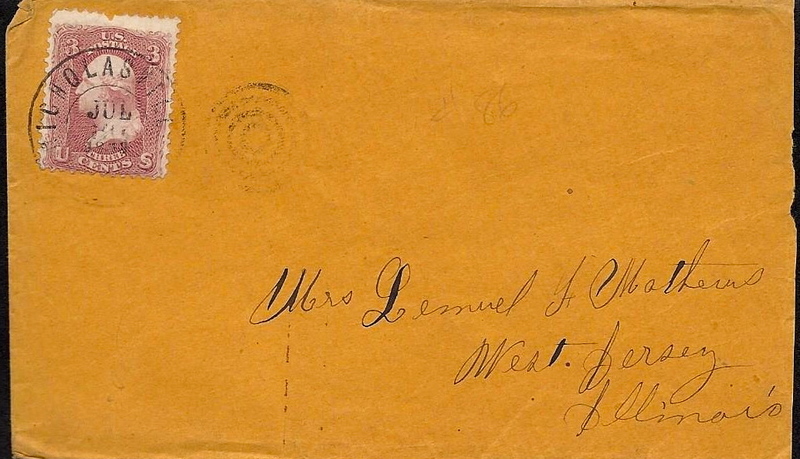 Lemuel enlisted in Company D, 112th Illinois Infantry in August 1862. He was shot in the upper right arm (or shoulder) at Resaca, Georgia on 14 May 1864. Lemuel was sent to a hospital at Chattanooga but gangrene and typhoid fever complicated his recovery and he was subsequently sent to hospitals in Nashville, Tennessee, and New Albany, Indiana. 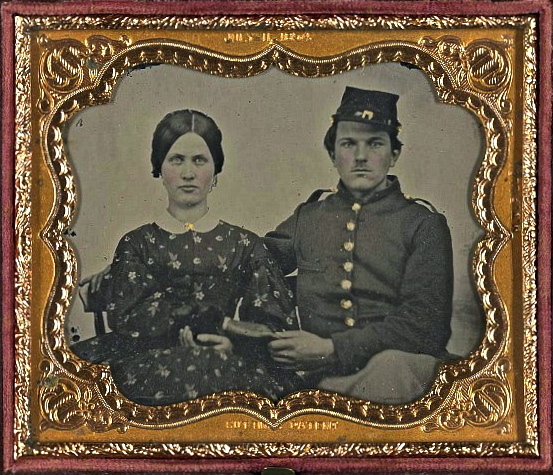 Lemuel survived the war but he lost the complete use of his right arm and, as such, was judged disabled and honorably discharged from Camp Butler, Illinois in August 1864. Lemuel wrote the letter to his wife, Lucretia [“Tishie”] Smith Treakle (1843-1910) whom he married in August 1862, just before leaving home. After the war, the couple relocated to Elmwood, Peoria County, Illinois and then to Spring Creek, Cowley County, Kansas by 1885. Mentioned in the second letter several times is Lemuel’s brother, Whitfield [“Whit”] D. Mathews (1838-18xx), who served in the same company. I received yours of the 13th last evening. I mailed you one in the morning. I guess if I mail you one every other day you ought to be satisfied. Your fifth letter I have not got yet. This one I have just received is the last you have wrote and that makes only five that I have received. You said that you have written six, therefore there is one that I have not received. I am glad to hear that you are getting along so well. I was out on patrol guard yesterday and last night I was on the reserve so Scofield, [William O.] Gamble & I had to stay in the guard house with about 40 prisoners. Some were deserters from the rebel army for they look for secesh talk around here, and the rest were in there for other things. In the forenoon, Gamble, Scofield, and I and a corporal were sent downtown to arrest a secesh. We found his house and searched it but did not find him. His wife told us that he was downtown. We went one till the guide which we had with us pointed him out. We marched up to him, told him what we wanted of him. He said he would go right along. We took him to the Provost Marshal’s Office and left him in his charge. They are taking up all the southern sympathizers that they can find & that is a good many, I tell you. We had a nice place to sleep last night. The building which we was in was one of the fairground buildings. It had no floor in it so us three took and laid our rubbers down on the dust, then placed a nice round stick of wood for a pillow, then buttoned our overcoats together to put over us (we did not take our woolen blankets with us for fear of livestock). We put our clothes under our heads and I tell you, we slept just as nice as you please. Was called up once about 12 o’clock to take a poor rebel deserter out to —-, then the rest of the night I slept well. Was relieved about 8 this morning. Our letters was brought to us. I received one from Mr. Mister with yours. It is still raining but not very hard and it makes my paper so damp that I can hardly write on it. You will have to think of a chance to write and then excuse the writing. I sometimes think that I would like to have hear from you oftener but I know that you write as often as you can so I will have to be satisfied. I read your letters over and look at your pictures (which couldn’t be bought at any price) and think of the happy time when I embrace you in my arms and if I am permitted to return, I will never leave my dear wife again. I think she is too good a woman to be left alone. As you say, I think we can not be thankful enough for I think it will be one of the greatest blessings that I could ask for is to have the assurance that I will be permitted to return to you in safety. I kind of think that I will return by next spring or in summer. I feel perfectly satisfied with my fare, and it agrees with me as well as it can. There is six or eight darkeys in our regiment — Captain [Augustus A. Dunn] & Lieutenant [Henry A. Griffin] has one. 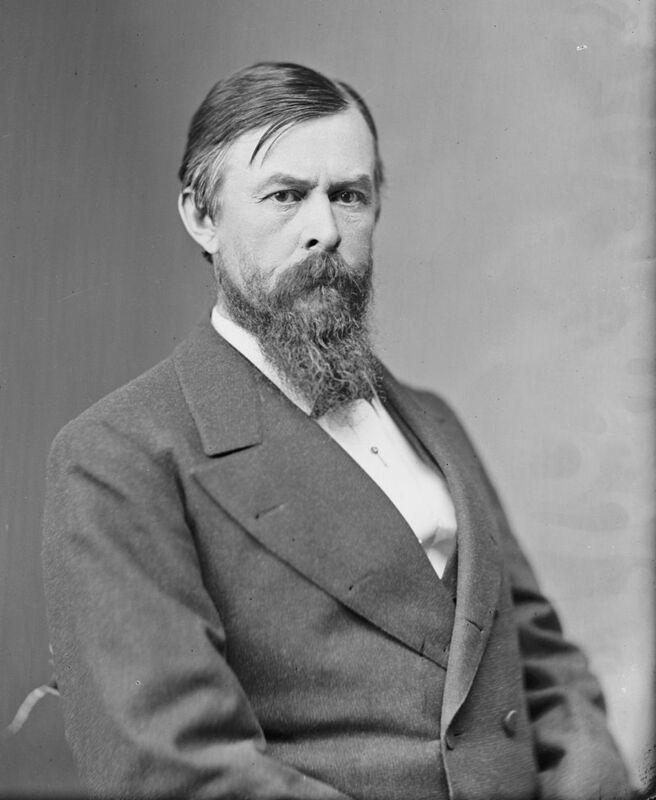 Our second lieutenant [Samuel L. Patterson] is not with us yet. I don’t know whether I told you about him going home from Peoria or not. He did and while there, took sick and has been sick ever since. I think he is better now though and perhaps he will be with us soon. I think [Thomas J.] Henderson has been more active since his defeat and I think he will soon make a good colonel. 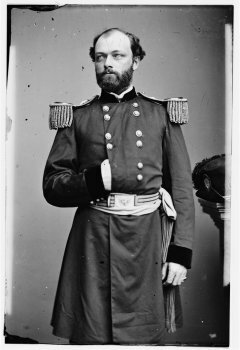 Our Brigade General’s name is Green Clay Smith and I tell you he’s well-liked, but the commander of this division is hated by most of the Illinois troops. His name is [Quincy Adams] Gillmore. ¹ He is a Kentucky man and proslavery at that. He has ordered some of the colonels to give up some of their negroes. They will not do it and there is a report that old Gillmore is under arrest for giving orders contrary top Lincoln’s Proclamation. I do hope it is so. I tell you, I believe the army is getting rid of such generals and I believe if the South don’t give up by the first of January that there will be a foreword movement made which will clear them out. Tishie, I think things look brighter than they have. I heard today that all the manufacturers that work for the government were stopped and that no quartermaster would be allowed to contract for rations for over 30 days. These things are not much, but they look encouraging. I expect the rainy season has begun and we perhaps will have wet weather for awhile, but our tents are good and I think we will not suffer. I would not take a good deal for my rubber blanket. If you have anything to do with that Soldier’s Aid Society, I would advise you never to send anything through any Sanitary Society or any certain hospital. I would advise you to send it to my friend Captain, or each one (if they make up a box) to put in and send to their friends or an individual they wish. My reasons for this is that those that are in the hospital are generally pretty sick and do not need much, and also that there is nurses and waiters about the hospital which will help themselves. And there is another fact, that is there is more out of the hospital not able for duty than there is in it, and all they want is just something different than the regular rations to build them up. There is six or eight in our company that is on the sick list and excused from duty which are lying around and if they had some little something such as butter, pickles, pepper, or any kind of preserved or canned fruit or anything of that kind, it would build them up and get them off of it. I don’t know what transportation would cost but [paper creased] to different one, might be sent to the regiment. I mention this so you can give others a hint. I don’t stand in need of any delicacies unless I get sick and I don’t feel much like it now. The boys are all well except Boyd. He is not as well as he was. I forgot to mention about Price in my last letter. He is getting better. There was two deaths in the regiment last night — one was in [John J.] Bigg’s company; the other was in Company A from Annawan. ³ They will be buried this afternoon. This makes my ninth letter to you. I have tried to answer all your questions but perhaps I miss something. I will not write anymore till …. GENERAL ORDERS, NO. 9. — The practice indulged in by some of the officers and men of this division, of enticing colored people within the lines, is becoming an evil of such magnitude as to demand the immediate and rigorous application of a remedy. It is demoralizing to an army to be encumbered with non-combatant hangers-on of any kind or class, and they will not be allowed in this division, except under such restrictions as will place them within direct and entire control from these headquarters. All those now within the lines, or that may hereafter in any way gain access thereto, will at once be taken in change by the Division Quartermaster and reported to these headquarters, for suen action thereon as may be defined expedient. By order of Brig.-Gen. Q.A. GILLMORE. GEORGETOWN, KY, Oct. 24, 1862. ² This was Joseph Hoover of Company C. Company records only indicate that he died at Lexington, Kentucky in December 1862. ³ This was probably Truman A. Woodruff of Company A. Company records only indicate that he died at Lexington, Kentucky in December 1862. I have had breakfast and just come back from watering my horse & now I am sitting on the ground with the Bugle Call on my knee using it for a writing desk, and writing with the pencil that you sent me. I came here yesterday. The rest of the detachment is still at Columbia. We that were left at Lebanon were ordered to the regiment and we all come in here yesterday and now all the Tennessee expedition are back to their respective regiments excepting about 75 of our regiment that is at Columbia and we are looking for them every day. I received your [letter] by Whit last friday, that being the first chance he had to send it through. I got one from him at the same time telling me that he was back and what he had for me, & wrote back to him to everything through to me that would not save and so he sent all the cake and such thing by a fellow that started for Lebanon the same morn that we left there and by some means he missed us on the road and I suppose he went on to Lebanon and will not be back until this evening. I found Whit well and in pretty good spirits. He gave me all that he had for me. He got me a very good pair of boots which I could have got along without for awhile but now I will have them when I need them. He also got me a handkerchief & a knife, spoon & fork combined so I owe him about $1.75 but he will have to do without it for I met with a little bad luck yesterday after I come in camp. I lost my pocket book with $5.00, a few postage stamps, & a gold pen, and I think there was a little change in it too. I made a thorough search but could not find any clue to it and I expect I never will. I have about $3.00 lent out and if I can get that, I can get along very well till payday. But if do need any, I can borrow it here and then that will save the trouble & risk of sending it back and forth. Tishie, I feel real lonesome this morn although we have one of the prettiest and shadiest camps that we have ever had since we came in the service. But in spite of all this, I real rather sad. Last evening Whit and I had a long talk by ourselves. He told me all about his trip and how our folks were getting along and how they looked and what they said but when I wanted to hear anything about my dear wife, or of her folks, I would have to ask and then I would just have my questions answered and then he was silent on that subject. And if I did not question him further, he would go on and talk about something else. And why is this reserve? He did not use to be so. Oh how much pleasanter it would be if he would tell me how you look and what you said. But no, he is silent, and all I can do is to read what you can communicate to me through the mail and look on those things that in love you sent me. It is this, dear one, that troubles me and I feel that it would do me good to take a good cry over it but that perhaps it would not look very manly in me for the boys are all sitting around me and Whit is lying by my side asleep. O, Tishie, what would I give if I was only with you for awhile for it seems as though I could unfold everything to you and tell you all my trouble and I would feel relieved. But we are far apart and to see you is impossible but it does seem hard when a brother will not tell me what he most assuredly knows that I so much want to know. But this kind of talk will not help matters any. But I will look in the future for ____ days when we ____ gain until and perhaps be settled in a comfortable quarters, how pleasant it would be to be keeping house. I long for the day and may the ____ of time fly swiftly around and speed them on. I shall have to get another sheet. I will now try and answer your letter which Whit brought for me but first I will have to get it and read it over once more. I have perused your letter I think about the fifth time. My thoughts often wonder back to that room where you spoke of being when you wrote your letter. Yes, those were happy hours that we spent there and I don’t know of any merry hours spent in your company that was not happy once to me and the thought of never spending any nor would be rather distressing, but we must not look on the dark side of things although such might be the case. But I do hope and pray that we will soon be united once again and then it seems to me that we will be happy. Of course, I was a little disappointed but I knew just how it was, and of course I would rather have ___ than to have a poor one. You need not be afraid of me being offended but I guess you know me better than that. There is no great need of me loving another for I have a very good one. But I thought that I would like to have a picture of my wife for the one that I have is of Lucretia S. Trickle but she looks just like my wife and my wife looks sweeter than Miss Trickle. But I used to think that she could not be beat. I will have to close this immediately for the order for us to leave has come. I don’t know as I had any feelings that I did not wish to read to you in any of my letters. I tried to be as frank as I ever was but perhaps I wrote in rather a hurried manner for sometimes I was hurried but I did not think I left anything out of any of my letters that would cause you to think that I was not as _____ as ever. Perhaps I do get the blues sometime and mix some in my letters but I will have to close for the boys are fixing up. I would like to write more but I can’t. So good bye, my darling wife. I will try and write soon again. This entry was posted on Thursday, May 1st, 2014 at 10:53 pm	and posted in Uncategorized. You can follow any responses to this entry through the RSS 2.0 feed.